A full-size sedan can work out well for a family like yours, and the popular option from Chevrolet has technology available in it that will impress you. 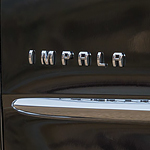 The Impala offers the latest technology to make your driving experiences great. You can do more with the Chevrolet Impala than you can do with a lot of other vehicles on the streets today. The touchscreen that is part of this sedan allows you to choose your favorite music to play and it also allows you to send texts right from your vehicle. Are you someone who struggles to have the right cords on hand when you have a device that you need to charge on the go? The Chevrolet Impala helps you out when you are looking to charge your phone but you do not have a cord with you. There is an available wireless charging system that you can have put in place in this vehicle.